Use white as a base colour and set out basic white necessities for a party – white tablecloth, white napkins, white vases. 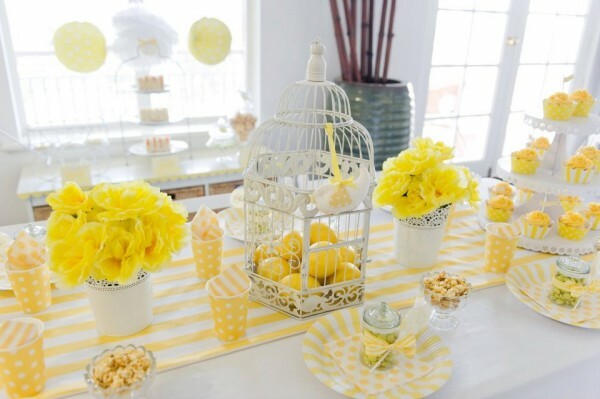 You could even do what Paisley Petal Events did above and use a white wire birdcage full of bright yellow lemons as a centre piece for your party. 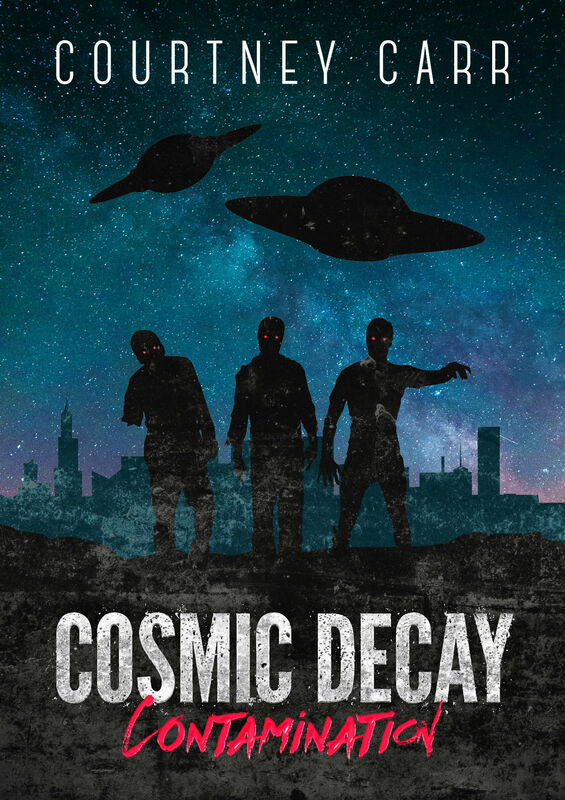 Next, add in the yellow. Yellow and white stripes and spots are a great way to blend the yellow and white together without being too overbearing on the yellow. Remember, it’s a yellow AND white party, not a yellow party with white highlights. 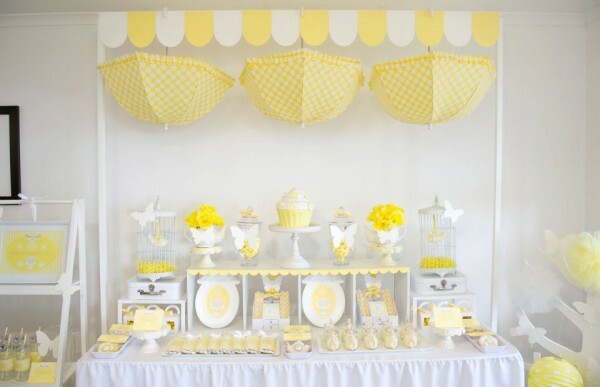 You can use the yellow and white in the form of table runners, plates cups and flowers. Don’t forget to use hanging decorations like flag bunting and garlands to decorate the rest of the venue in the yellow and white theme. White and yellow spaced pom poms of lanterns look really good together, especially hanging up over candy buffets or dinner tables. 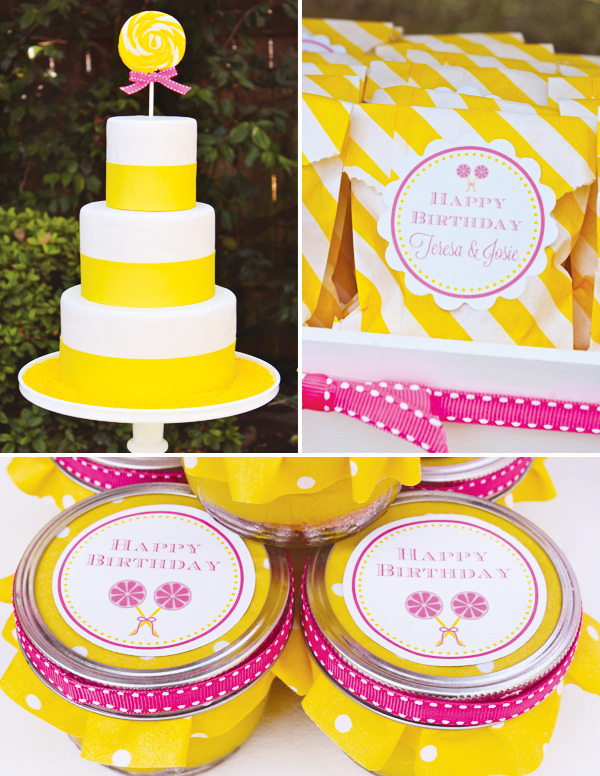 Yellow and white cardboard cutouts are also a fun summery look for a beachy lemonade party – they give it the look of a candy store! 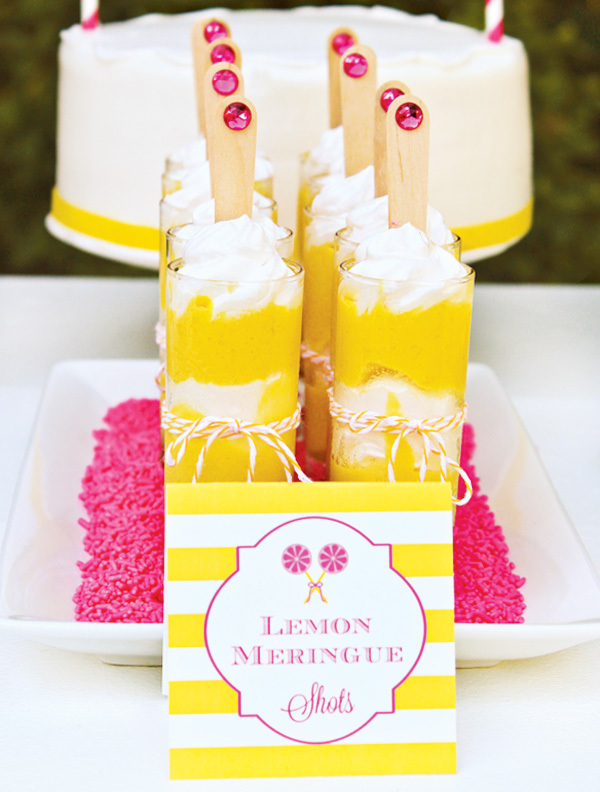 Serve a fun variety of yellow or lemon food at your yellow and white party. Make vanilla cupcakes with yellow icing served in yellow and white striped cupcake holders, or make limoncello cordial to be served in vintage milk bottles. You can even do what Hostess with the Mostess did and serve a variety of lemon flavoured items, like lemon meringue shots! You can also make an amazing but simple looking limoncello flavoured cake with yellow fondant ribbon around the outside. Don’t forget to give yellow and white favorus to your guests when they leave as well! ← Haunted Black Light Portrait Cookies!